Paul originally found this recipe for a guys weekend and liked it so much we have started to make it at home. It is really easy to put together and the results are quite amazing. These make great tacos and I am thinking about using the leftovers (if we ever have any) for enchiladas. I will report back once that happens. This is not our recipe at all and we really haven’t adapted much either. But it almost seems a shame not to share it. So here it is, in all of its awesomeness. Preheat oven to 300°F. Combine all of the ingredients into a Dutch oven, including the spent orange halves. Place on stove and bring to a simmer on medium-high heat, uncovered. Once it simmers, cover and put into the preheated oven. Cook for 2 hours. Remove Dutch oven after 2 hours and check to see if the meat can pull apart. Remove, with a slotten spoon, all of the meat and put onto a foil lined pan. Discard any other solids (oranges, onion, and bay leaves), reserving cooking liquid. Bake on the stove top, bring the liquid to a boil and reduce to about 1 cup. This should take 20 minutes. While the liquid reduces, pull the meat apart into three pieces. You don’t want to pull it completely apart, just into smaller bites. Once liquid has reduced, put the meat back in to cover. Salt & pepper more to taste. 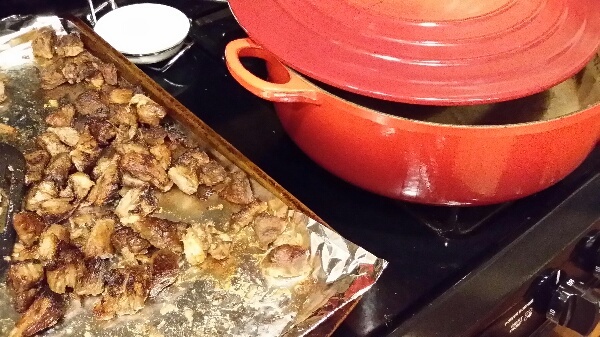 Spread pork back out onto the foil lined pan and spread out evenly in one layer. Broil meat 6 inches under broiler until crisp, toss the meat and spread out evenly again, and recrisp. This should take 8 – 10 minutes per side. Keep watch. 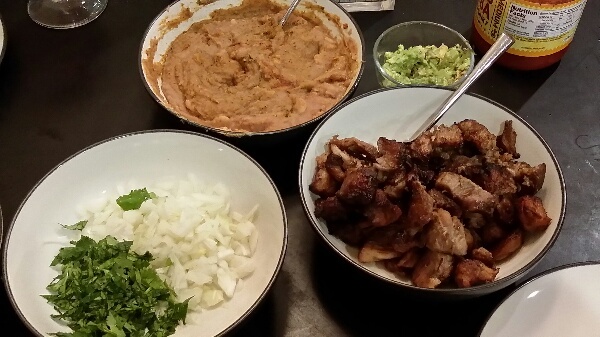 Serve with tortillas and your favorite toppings.